Bust 31.5-32.5", Waist 24-25", Hips 33.5-34.5"
70s Designer, Retro Bohemian Clothing Patterns - Betsey Johnson of Alley Cat MISSES' JUMPER, HAT, BAG & EMBROIDERY TRANSFERS Jumper in two lengths has detachable bib, bias self ruffles at shoulders, dirndl skirt with back buttoned closing, waistband, attached self sash, and large patch pockets with bias self ruffles; topstitch trim. Purchased tops. Hat has four section crown and wide topstitch brim with bias self ruffle. Tote bag has attached straps and bias ruffles. 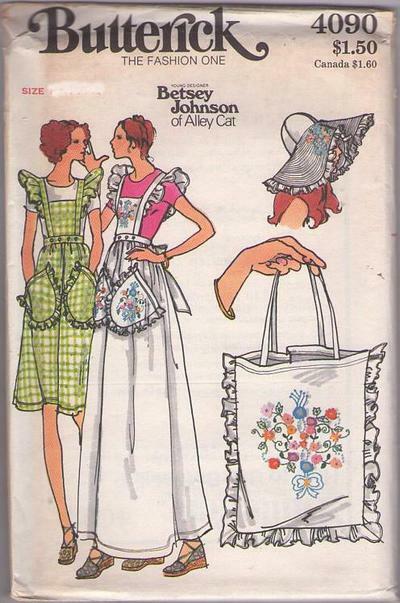 Instructions and transfers included for embroidery.